Are you tired of coming home to a darkened house? Looking for extra security outside your home at night? Feel like your home lacks ambiance? If so, it may be time for you to install outdoor lighting. Illuminating the exterior of your home has countless benefits and can do a lot to increase your curb appeal for resale. You may also be able to experience a much greater return on investment depending on how carefully you install the lighting your home requires. 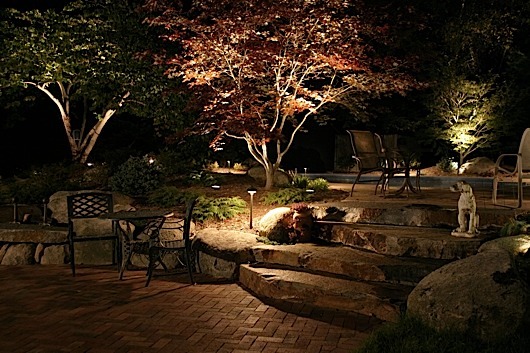 Included here are a few benefits of installing outdoor lighting on your home. Everyone loves enjoying their outdoor spaces; but without proper lighting it can be hard to take advantage of the evening hours. Adding outdoor lighting will increase the homey ambiance of the exterior of your home, and make an outdoor living space just as good as the interior! Choose lighting that will illuminate living spaces from above to make game playing and eating easier. For late nights, you will likely want dimmer lighting that does not seem as harsh. For areas around a fire pit or water feature, consider illuminating only the pathways, or placing lanterns among plants. Lighting that illuminates but is indirect is the most effective ambiance creator for late evenings. Getting out of your car late at night can be a bit scary in any neighborhood. Not only do you have concerns about who else may be out and about, but there are also the dangers of tripping and falling. Security lighting is an important addition to any home. The main type of security lights that you will want to install will be overhead lights. This can be an exterior garage light, a house light or a motion-triggered light. Make sure these lights are not going to be shining in through your bedroom window, but keep them bright enough to illuminate the surrounding areas. Secondary security lighting will help you get where you are going. If you think overhead lights, or motion-sensor lights, are too harsh and bright, it can be wise to do lower-key lighting. Many people enjoy having lights placed along their pathways, or running along the edge of their steps. This can help you have sure footing after dark, especially if you are accompanied by an older parent or friend. Many people enjoy the look of lights shining up at their house or trees after dark with landscape lighting. This is the kind of lighting that will likely lead to increased home value. It is important that you have these lights installed professionally, as they will be able to fit you with the right kind of bulbs and set-ups for both trees and houses alike.